Lipomyelomeningoceles (LMCs) are fat and fibrous masses that invade and tether the caudal spinal cord. 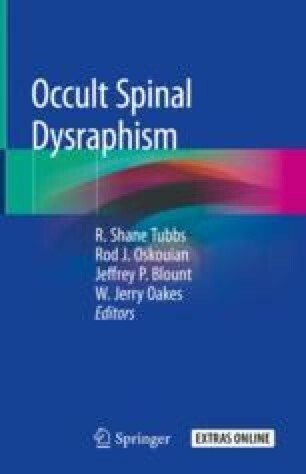 They are the most common and challenging form of occult spinal dysraphism. Experience and approach differ between experienced centers and outcomes vary widely. The tethered cord syndrome (TCS) likely plays a central but not singular role in the pathophysiology of LMCs. The recognition that surgery could arrest decline from LMC-induced TCS led to initial widespread enthusiasm for surgery for symptomatic patients and prophylactic surgery for asymptomatic patients. Significant recurrence of symptoms in symptomatic patients and a broader understanding of the longitudinal outcomes and natural history of lipomas led to an evolution toward more conservative approaches in many centers. Surgical untethering is recommended for symptomatic patients. The role of prophylactic surgery to prevent decline is controversial and appears to be evolving somewhat more conservatively. Radical resection is associated with the best reported outcomes but appears technically elusive to the majority of pediatric neurosurgical centers. Longitudinal multidisciplinary care appears important in optimizing outcomes and patient satisfaction. Each center must individualize their approach based upon their own training, skills, outcome, and understanding of the natural history of LMCs.